Most foot surgery is elective and not an emergency. Podiatrists are known to routinely operate to correct bunions and hammertoes. There are no quick fixes or corrective devices that you can wear to make the toes straight. In other words, you accommodate the deformities, work around it and make it comfortable or you get rid of it. If you are a healthy individual with an active lifestyle regardless of age and have tried to accommodate the condition, oftentimes surgery is the best option. Most commonly with a moderate bunion deformity, the procedure of choice involves operating at the bump. Recovery for this involves immediately walking on the heel after the surgery for the first two weeks in a special boot, then full-weightbearing in the boot for week three and four. The quickest you’ll be back into a sneaker is at 4 weeks. If you have a more severe bunion deformity, then it involves a procedure further back from the bump towards the midfoot. Recovery after this involves not walking at all on the affected foot for at least four weeks, followed by partial weightbearing on the heel in the boot, then full weightbearing in the foot for another week, then back into a sneaker at the quickest at six weeks. 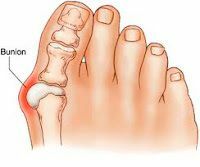 Regardless of the type of bunion surgery, you will go to outpatient physical therapy to preserve function, flexiblity and to decrease pain. Right foot surgery involves not driving at all until you are at least back into a sneaker. Recovery is a gradual. It usually takes a good three months before the foot feels better than the normal. After foot surgery, for optimal results, you should stay off the foot as much as possible, keep the foot elevated and ice it on a continued basis. Once you make it through the recovery period, the goal is to improve your quality of life.